MAUNA LOA OBSERVATORY, Hawaii -- At nightfall, 11,000 feet up, under the summit of a looming volcano, the black lava moonscape cools as the sun's tropical heat escapes upward. Settling, subsiding, some of the world's purest air -- a sample of the entire central Pacific atmosphere -- descends on the dusk, cloaking Mauna Loa in stillness. That's when John Barnes flips on his emerald-tinged laser and shoots it into the sky. While it can reach up 60 miles, the primary target of Barnes' laser is the stratosphere, the cold, cloudless layer that sits atop the planet's bustling weather -- home of commercial jets and the ozone hole. 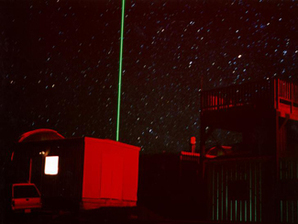 The laser's concentrated 20 watts, a green beam visible miles away from the volcano, reflect off any detritus in its path, these wisps of evidence collected by the observatory's three large mirrors. Barnes has kept a lonely watch for 20 years. Driving the winding, pothole-strewn road to this government-run lab, he has spent evening after evening waiting for the big one. His specialty is measuring stratospheric aerosols, reflective particles caused by volcanoes that are known to temporarily cool the planet. Only the most violent volcanic eruptions are able to loft emissions above the clouds, scientists thought, and so Barnes, after building the laser, waited for his time. 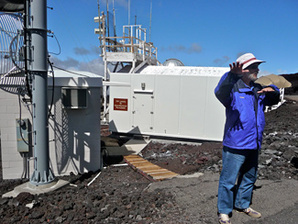 For nearly 20 years, John Barnes has fired his green laser into the skies above Hawaii's Mauna Loa volcano, monitoring particles suspended high above the weather. At night, the beam is visible for miles. Photo courtesy of John Barnes. To this day, there hasn't been a major volcanic eruption since 1991, when Mount Pinatubo scorched the Philippines, causing the Earth to cool by about a half degree for several years. But Barnes diligently monitored this radio silence, identifying the background level of particles in the stratosphere. And then, sitting in his prefab lab four years ago, not far from where Charles Keeling first made his historic measure of rising atmospheric carbon dioxide levels, Barnes saw something odd in his aerosol records. "I was just updating my graph, and I noticed that, 'Hey, this is increasing,'" Barnes said during a recent interview. It was unexpected. Where were these particles coming from, without a Pinatubo-style eruption? "No one had seen that before," he said. Barnes had uncovered a piece of a puzzle that has provoked, frustrated and focused climate scientists over the past half decade. It is a mystery that has given cover to forces arrayed against the reality of human-driven global warming. And it is a question that can be easily stated: Why, despite steadily accumulating greenhouse gases, did the rise of the planet's temperature stall for the past decade? "If you look at the last decade of global temperature, it's not increasing," Barnes said. "There's a lot of scatter to it. But the [climate] models go up. And that has to be explained. Why didn't we warm up?" The question itself, while simple sounding, is loaded. By any measure, the decade from 2000 to 2010 was the warmest in modern history. However, 1998 remains the single warmest year on record, though by some accounts last year tied its heat. Temperatures following 1998 stayed relatively flat for 10 years, with the heat in 2008 about equaling temperatures at the decade's start. The warming, as scientists say, went on "hiatus." The hiatus was not unexpected. Variability in the climate can suppress rising temperatures temporarily, though before this decade scientists were uncertain how long such pauses could last. In any case, one decade is not long enough to say anything about human effects on climate; as one forthcoming paper lays out, 17 years is required. For some scientists, chalking the hiatus up to the planet's natural variability was enough. Temperatures would soon rise again, driven up inexorably by the ever-thickening blanket thrown on the atmosphere by greenhouse gases. People would forget about it. "It has always bothered me," said Kevin Trenberth, head of the climate analysis section at the National Center for Atmospheric Research. "Natural variability is not a cause. One has to say what aspect of natural variability." Trenberth's search has focused on what he calls "missing energy," which can be thought of as missing heat. The heat arriving and leaving the planet can be measured, if crudely, creating a "budget" of the Earth's energy. While this budget is typically imbalanced -- the cause of global warming -- scientists could account for where the heat was going: into warming oceans or air, or melting ice. In effect, the stall in temperatures meant that climatologists no longer knew where the heat was going. It was missing. The hunt for this missing energy, and the search for the mechanisms, both natural and artificial, that caused the temperature hiatus are, in many ways, a window into climate science itself. Beneath the sheen of consensus stating that human emissions are forcing warmer temperatures -- a notion no scientist interviewed for this story doubts -- there are deep uncertainties of how quickly this rise will occur, and how much air pollution has so far prevented this warming. Many question whether energy is missing at all. For answers, researchers across the United States are wrestling with a surge of data from recent science missions. They are flying high, sampling the thin clouds crowning the atmosphere. Their probes are diving into deep waters, giving unprecedented, sustained measures of the oceans' dark places. And their satellites are parsing the planet's energy, sampling how much of the sun's heat has arrived, and how much has stayed. 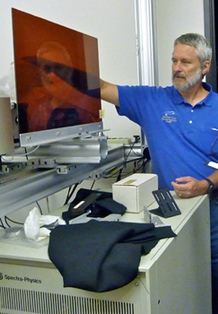 Barnes, right, with the laser at the heart of his aerosol monitoring; in the room next door, three mirrors, exposed at night through a creaking, skyward-facing hatch, collect wisps of the laser's reflections. Photo courtesy of Bess Dopkeen. "What's really been exciting to me about this last 10-year period is that it has made people think about decadal variability much more carefully than they probably have before," said Susan Solomon, an atmospheric chemist and former lead author of the United Nations' climate change report, during a recent visit to MIT. "And that's all good. There is no silver bullet. In this case, it's four pieces or five pieces of silver buckshot." This buckshot has included some familiar suspects, like the Pacific's oscillation between La Niña and El Niño, along with a host of smaller influences, such as midsize volcanic eruptions once thought unable to cool the climate. The sun's cycles are proving more important than expected. And there are suspicions that the vast uptick in Chinese coal pollution has played a role in reflecting sunlight back into space, much as U.S. and European pollution did decades ago. These revelations are prompting the science's biggest names to change their views. Indeed, the most important outcome from the energy hunt may be that researchers are chronically underestimating air pollution's reflective effect, said NASA's James Hansen, head of the Goddard Institute for Space Studies. Recent data has forced him to revise his views on how much of the sun's energy is stored in the oceans, committing the planet to warming. Instead, he says, air pollution from fossil fuel burning, directly and indirectly, has been masking greenhouse warming more than anyone knew. It is a "Faustian bargain," he said, and a deal that will come due sooner than assumed. Some years, you have El Niño. Others, it's La Niña. Rarely does Super El Niño arrive. Understanding the warming hiatus starts and ends, literally, with El Niño and La Niña, the Janus-faced weather trends of the Pacific Ocean. Every so often, due to reasons that elude scientists, the ocean's equatorial waters heat or cool to unusual degrees. These spells influence the world's climate on a short-term basis, including surges in temperature and precipitation, like the current Texas drought. The record-setting year of 1998 saw one of the largest El Niños in modern history -- a Super El Niño. That summer, many Americans learned that what seemed like a foreign-sounding abstraction could cause brownouts halfway across the world, as the average temperature increased by 0.2 degrees Celsius. Conversely, the years stacked near the end of the hiatus period saw an unusual number of La Niñas, which helped suppressed global temperatures. Researchers have long argued that using 1998 as a starting point was, then, unfair. "Climate scientists were right that it was a cherry-picked observation, starting with an El Niño and ending with a La Niña," said Robert Kaufmann, a geographer at Boston University who recently studied the hiatus period. The temperature spike of 1998 was not just about El Niño, though; it was also enabled by an absence in the air. From the 1950s to the late 1970s, it is now widely agreed that the smog and particles from fossil fuel burning, by reflecting some of the sun's light back into space, masked any heating that would be felt from increased greenhouse gases. As clean air laws began to pass in the United States and Europe, this pollution began to disappear in the 1990s, a process known as "global brightening." It is difficult to overstate how important pollution has been to blocking the sun's energy. According to an influential energy budget prepared several years ago, human pollution, along with volcanic eruptions, masked 70 percent of the heating caused by greenhouse gases between 1950 and 2000. Another 20 percent of this heating escaped into space, with 10 percent going into warming the climate, largely in the oceans. By the late 1990s, much of this pollution had vanished. The sun was unleashed, no longer filtered, and greenhouse gases were continuing to trap more of its heat. There had been no eruptions since Pinatubo. El Niño flared. Conditions were perfect for a record. When the record came in 1998, though, scientists faltered. It's a pattern often seen with high temperatures. They cut out too much nuance, said John Daniel, a researcher at the Earth System Research Lab of the National Oceanic and Atmospheric Administration. "We make a mistake, anytime the temperature goes up, you imply this is due to global warming," he said. "If you make a big deal about every time it goes up, it seems like you should make a big deal about every time it goes down." For a decade, that's exactly what happened. Skeptics made exaggerated claims about "global cooling," pointing to 1998. (For one representative example, two years ago columnist George Will referred to 1998 as warming's "apogee.") Scientists had to play defense, said Ben Santer, a climate modeler at Lawrence Livermore National Laboratory. "This no-warming-since-1998 discussion has prompted people to think about the why and try to understand the why," Santer said. "But it's also prompted people to correct these incorrect claims." Even without skeptics, though, the work explaining the hiatus, and especially refining the planet's energy imbalance, would have happened, NASA's Hansen added. It was in no "way affected by the nonsensical statements of contrarians," Hansen said. "These are fundamental matters that the science has always been focused on. The problem has been the absence of [scientific] observations." Gradually, those observations have begun to arrive. For decades, it has been known that the sun moves through irregular, 11-year cycles that see its magnetic activity wax and wane. During the solar minimums, the sun's surface is quiet and relatively still; during maximums, it is punctuated by salt and pepper magnetic distortions: dark sun spots, which decrease its radiance, and hot white "faculae," torches of light that increase its radiance. Overall, during maximums the faculae seem to win out, causing the sun's brightness to increase by 0.1 percent. Only recently have climate modelers followed how that 0.1 percent can influence the world's climate over decade-long spans. (According to best estimates, it gooses temperatures by 0.1 degrees Celsius.) Before then, the sun, to quote the late comedian Rodney Dangerfield, got no respect, according to Lean, a voluble solar scientist working out of the the space science division of the Naval Research Laboratory, a radar-bedecked facility tucked away down in the southwest tail of Washington, D.C. Founded in the 1950s, the Mauna Loa Observatory is perched near the summit of an active volcano, 11,000 feet above sea level. The volcano last erupted in 1984, giving the observatory a scare. They have since plowed a barrier to divert potential lava: "They told me it would work," Barnes said. Photo courtesy of Bess Dopkeen. Climate models failed to reflect the sun's cyclical influence on the climate and "that has led to a sense that the sun isn't a player," Lean said. "And that they have to absolutely prove that it's not a player." This fading bias stems from the fervent attachment some climate skeptics have to the notion that the sun, not human emissions, caused global warming over the past few decades. As Lean notes, such a trend would require the sun to brighten more in the past century than any time in the past millennium, a dynamic unseen during 30 years of space observation. Yet fears remained that conceding short-term influence, she said, would be like "letting a camel's nose into the tent." NASA's Hansen disputes that worry about skeptics drove climate scientists to ignore the sun's climate influence. His team, he said, has "always included solar forcing based on observations and Judith's estimates for the period prior to accurate observations." There has been a change, however, he added. Previously, some scientists compared the sun's changing heat solely to the warming added by greenhouses gases and not the combined influence of warming gases and cooling pollution. And if air pollution is reflecting more sunlight than previously estimated, as Hansen suspects, the sun will indeed play an important role, at least in the upcoming decades. "That makes the sun a bit more important, because the solar variability modulates the net planetary energy imbalance," Hansen said. "But the solar forcing is too small to make the net imbalance negative, i.e., solar variations are not going to cause global cooling." According to Lean, the combination of multiple La Niñas and the solar minimum, bottoming out for an unusually extended time in 2008 from its peak in 2001, are all that's needed to cancel out the increased warming from rising greenhouse gases. Now that the sun has begun to gain in activity again, Lean suspects that temperatures will rise in parallel as the sun peaks around 2014. There's still much to learn about the sun's solar cycles. Satellites are tricky. Lean spends much of her time separating what are changes in brightness versus instrument problems on satellites. (Her favorite error? Proteins accumulating on a camera lens, introducing spurious trends.) Meanwhile, she has also found that the past three solar cycles, confoundedly, each had similar changes in total brightness, despite the first two cycles being far more abundant in sun spots and faculae than the last. This consistent trend has prompted Lean to take a rare step for a climate scientist: She's made a short-term prediction. By 2014, she projects global surface temperatures to increase by 0.14 degrees Celsius, she says, driven by human warming and the sun. Will her prediction come true? Check back in with her in three years, she said. Five years ago, a balloon released over Saharan sands changed Jean-Paul Vernier's life. "We suggested that it was coal burning," Barnes said. Among the many chemicals released by coal burning is sulphur dioxide, a gas that forms a reflective aerosol, called sulfate, in the sky. While this pollution is well-known for its sun-blocking talents, few suspected that sulphur dioxide from coal power plants could reach the stratosphere. It was a controversial hypothesis. Only the sulphur gas from Pinatubo-like events should reach that high. A French scientist who moved to NASA's Langley Research Center in Virginia to study aerosols, Vernier, like Barnes, turned toward a laser to understand these rogue sulfates. But rather than using a laser lashed to the ground, he used a laser in space. The same year as the Niger balloon campaign, NASA had launched a laser-equipped satellite aimed at observing aerosols among the clouds. Vernier and his peers suspected, with enough algorithmic ingenuity, that they could get the laser, CALIPSO, to speak clearly about the stratosphere. The avalanche of data streaming out of the satellite was chaotic -- too noisy for Barnes' taste, when he took a look -- but several years on, Vernier had gotten a hold of it. He had found an answer. Mostly, the aerosols didn't seem to be China's fault. Thanks to CALIPSO's global coverage, Vernier saw that his sulfate layer stemmed from a mid-size volcanic eruption at the Soufrière Hills volcano in Montserrat, a tiny British island in the Lesser Antilles. The satellite found that the eruption's plume floated into the stratosphere, carried upward by an equatorial air current. Digging back into other satellite data, this summer Vernier identified other midsize eruptions that reached the stratosphere: Indonesia and Ecuador in 2002 and Papua New Guinea in 2005. "They've pretty much shown that it's not really coal burning," Barnes said. "There were three eruptions that were kind of spaced ... and that's really what was making the increase. You'd still think that the coal burning could be part of it. But we really don't have a way to separate out the two tracks." Vernier's work came to the attention of Susan Solomon, an atmospheric chemist with NOAA who had been working with Barnes' data to puzzle out if this "background" of stratospheric sulfates had helped cause the stall in temperatures. On a decadelong scale, even a tenth of a degree change would have been significant, she said. Solomon was surprised to see Vernier's work. She remembered the Soufrière eruption, thinking "that one's never going to make it into the stratosphere." The received wisdom then quickly changed. "You can actually see that all these little eruptions, which we thought didn't matter, were mattering," she said. Already Solomon had shown that between 2000 and 2009, the amount of water vapor in the stratosphere declined by about 10 percent. This decline, caused either by natural variability -- perhaps related to El Niño -- or as a feedback to climate change, likely countered 25 percent of the warming that would have been caused by rising greenhouse gases. (Some scientists have found that estimate to be high.) Now, another dynamic seemed to be playing out above the clouds. In a paper published this summer, Solomon, Vernier and others brought these discrete facts to their conclusion, estimating that these aerosols caused a cooling trend of 0.07 degrees Celsius over the past decade. Like the water vapor, it was not a single answer, but it was a small player. These are the type of low-grade influences that future climate models will have to incorporate, Livermore's Santer said. "Susan's stuff is particularly important," Santer said. "Even if you have the hypothetical perfect model, if you leave out the wrong forcings, you will get the wrong answer." As scientists have assembled these smaller short-term influences on the climate, a single questionable variable has girded, or threatened to undermine, their work: It is far from clear how much absent warming they should be hunting. For several years, Trenberth, at the National Center for Atmospheric Research, has challenged his colleagues to hunt down the "missing energy" in the climate. Indeed, much to his chagrin, one such exhortation was widely misinterpreted when Trenberth's letters leaked from the University of East Anglia's Climatic Research Unit in 2009. Trenberth has received so many queries related to the email that half his professional website debunks misreadings of a single sentence he wrote years ago. Until 2003, scientists had a reasonable understanding where the sun's trapped heat was going; it was reflected in rising sea levels and temperatures. Since then, however, heat in the upper ocean has barely increased and the rate of sea level rise slowed, while data from a satellite monitoring incoming and outgoing heat -- the Earth's energy budget -- found that an ever increasing amount of energy should be trapped on the planet. (Some scientists question relying on this satellite data too heavily, since the observed energy must be drastically revised downward, guided by climate models.) Given this budget ostensibly included the solar cycle and aerosols, something was missing. Recently, working with Gerald Meehl and others, Trenberth proposed one answer. In a paper published last month, they put forward a climate model showing that decade-long pauses in temperature rise, and its attendant missing energy, could arise by the heat sinking into the deep, frigid ocean waters, more than 2,000 feet down. The team used a new model, one prepared for the next U.N. climate assessment; unlike past models, it handles the Pacific's variability well, which "seems to be important," Trenberth said. A collection of prefab buildings and expensive electronics, Mauna Loa Observatory is exposed to freezing conditions and peaks of UV radiation. Dry and sunny, it is a far cry from the rainforest conditions in Hilo, the faded seaside town where Barnes and his staff live, commuting to the volcano once or twice a week. Photo courtesy of Bess Dopkeen. "In La Niña, the colder sea surface temperatures in the Pacific mean there is less convective action there -- fewer tropical storms, etc., and less clouds, but thus more sun," he said. "The heat goes into the ocean but gets moved around by the ocean currents. So ironically colder conditions lead to more heat being sequestered." It is a compelling illustration of how natural variability, at least in this model, could overcome the influence of increasing greenhouse gases for a decade or more, several scientists said. However, according to one prominent researcher -- NASA's Hansen -- it's a search for an answer that doesn't need to be solved. Over the past decade, for the first time, scientists have had access to reliable measures of the ocean's deep heat, down to 5,000 feet below sea level, through the Argo network, a collection of several thousand robotic probes that, every few days, float up and down through the water column. This led Hansen to conclude that net energy imbalance was, to be briefly technical, 0.6 watts per square meter, rather than more than 1 watt per square meter, as some had argued. For decades, scientists have known that most of the heat trapped by greenhouse gases was going into the ocean, not the atmosphere; as a result, even if emissions stopped tomorrow, they said, the atmosphere would continue to warm as it sought balance with the overheated oceans. In a term Hansen coined, this extra warming would be "in the pipeline," its effects lingering for years and years. But exactly how much warming would be in the pipeline depended on how efficiently heat mixed down into the oceans. Hansen now believes he has an answer: All the climate models, compared to the Argo data and a tracer study soon to be released by several NASA peers, exaggerate how efficiently the ocean mixes heat into its recesses. Their unanimity in this efficient mixing could be due to some shared ancestry in their code. Whatever the case, it means that climate models have been overestimating the amount of energy in the climate, seeking to match the surface warming that would occur with efficient oceans. They were solving a problem, Hansen says, that didn't exist. At first glance, this could easily sound like good news, if true. But it's not. "Less efficient mixing, other things being equal, would mean that there is less warming 'in the pipeline,'" Hansen said. "But it also implies that the negative aerosol forcing is probably larger than most models assumed. So the Faustian aerosol bargain is probably more of a problem than had been assumed." Essentially, future warming may be more in human control than expected, but if aerosols, either directly or through their role in forming clouds, are blocking more of the sun's heat than realized, than the continued demise of these particles due to air pollution controls could see surface temperatures rise rapidly -- Hansen's "Faustian" bargain. Hansen's paper is prompting discussion throughout the climate science community, even before its publication. Putting a hard number on the reflectivity caused by aerosols and the clouds they seed has been one of the science's main goals, and Hansen, according to John Seinfeld, an atmospheric chemist at Caltech who has reviewed a draft of the study, has constrained that uncertainty, if not removed it entirely. Trenberth questions whether the Argo measurements are mature enough to tell as definite a story as Hansen lays out. He has seen many discrepancies among analyses of the data, and there are still "issues of missing and erroneous data and calibration," he said. The Argo floats are valuable, he added, but "they're not there yet." When looking at the decade of stalled warming in light of these findings, it is clear that the solar minimum and volcanic sulfates played a role in lowering the energy imbalance. But focusing on them is a bit like -- and here Hansen invokes a hoary science truism -- the drunk looking for his keys underneath a streetlight. He lost his keys out in the darkness, but searches beneath the lamp, he says, because that's where the light is. "Unfortunately, when we focus on volcanic aerosol forcing, solar forcing and stratospheric water vapor changes, it is a case of looking for our lost keys under the streetlight," Hansen said. "What we need to look at is the tropospheric aerosol forcing, but it is not under the street light." And hidden in that darkness, somewhere, is the role of Chinese coal. It seems obvious now. Global brightening couldn't last forever. It is the biggest unknown of the past decade. During that time, fueling its unparalleled growth, Chinese coal consumption increased 200 percent, from 1.2 million to 3.7 million tons. At least at first, much of this burning came without the controls used in the West to prevent sulphur dioxide emissions. According to one study, China's sulphur emissions rose 53 percent between 2000 and 2006. Maybe this pollution didn't reach the stratosphere, as Barnes suspected, but surely it has been reflecting sunlight? It's a reasonable suspicion, but far from clear, NASA's Hansen said. "I suspect that there has been increased aerosols with the surge in coal use over the past half decade or so," he said. "There is semi-quantitative evidence of that in the regions where it is expected. Unfortunately, the problem is that we are not measuring aerosols well enough to determine their forcing and how it is changing." This past summer, Robert Kaufmann, the BU geographer, made waves when he released a modeling study suggesting that the hiatus in warming could be due entirely to El Niño and increased sulfates from China's coal burning. While the figures Kaufmann used for the study were based on the country's coal combustion, and not actual emissions -- a big point of uncertainty -- many scientists saw some truth in his assertions. During the 1980s and '90s, the rapid decline of air pollution in the United States and Europe dominated the world's aerosol trends. While those emissions have continued to decline in the West, returns, from a brightening standpoint, have diminished, just as coal combustion ramped up in Asia. It's not that the world is getting dimmer again; it's that it's no longer getting brighter. "It's not an obvious overall trend anymore," said Martin Wild, a lead author of the United Nations' next climate assessment at the Swiss Federal Institute of Technology, Zurich. But, he added, "it fits quite well with [coal power] generation. For me, it's quite striking that it seems to fit quite nicely. But it could still be by chance." Kaufmann's study originated in a public talk he gave about climate change, he said. During the question time, a "regular guy" stood up and told Kaufmann that he had heard on the radio that the climate hasn't warmed in 10 years. He was piqued. Digging into relevant studies, he then saw a bunch of "nonsense" in the literature decrying the unfair use of 1998, the Super El Niño year, as a baseline. Skeptics had thrown down a gauntlet. It had to be picked up. 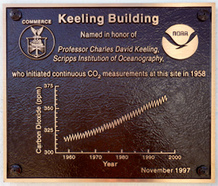 Mauna Loa was the site for Charles Keeling's work demonstrating rising CO2 levels in the atmosphere. A careful experimentalist, within five years Keeling had identified the trend. "It was an amazing data set," Barnes said. "Here we are out in the middle of the Pacific, 4,000 kilometers from [major] cities, and we're seeing the atmosphere being affected by fossil fuels." Photo courtesy of Bess Dopkeen. "If you have a good model of climate, it should be able to explain what's going on in any 10-year period," he said. A few years back, he had devised his own model, based on principles from econometrics, rather than physics simulations. It seemed a perfect time to bring its code out of mothballs in search of an answer. It settled on Chinese coal. Kaufmann's findings may only be relevant for so long. Since 2006, China has begun to mandate scrubbers for its coal-fired power plants, though it is uncertain how often the scrubbers, even when installed, are operated. But change is coming, said Daniel Jacob, an atmospheric chemist at Harvard University. "The sulfate sources have been leveling off, because they've been starting to put serious emission controls on their power plants," Jacob said. "It's interesting. When you look at the future emission scenarios from the [next U.N. climate report], you see SO2 emissions dropping like a rock, even in the coming decades. Because basically China is going to have to do something about its public health problem." More scrubbers -- good news for the Chinese, but not for short-term warming. "You could have a repeat of the rapid warming of 1980s and 1990s," Kaufmann said. 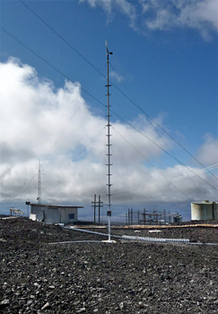 On the top of Mauna Loa, there are no concerns about air pollution. During the day, as Barnes gives a tour of the site's odd mix of steel containers and sophisticated sensors to a group of college students from Quebec, he points out over the ocean to Maui, where the summit of Haleakala is visible, more than 85 miles away. "That you can see it tells you something about how clear the air is," he said. After the tour, sitting in his office, his laser in the next room, Barnes laments the boggling complexity of separating all the small forcings on the climate. It makes Charles Keeling's careful work identifying rising CO2 levels seem downright simple. "It's really subtle," he said. "It's hard to track how much is going into the oceans, because the oceans are soaking up some of the heat. And in a lot of places the measurements just aren't accurate enough. We do have satellites that can measure the energy budget, but there's still assumptions there. There's assumptions about the oceans, because we don't have a whole lot of measurements in the ocean." Indeed, many of the scientists sorting out the warming hiatus disagree with one another -- in a chummy, scholarly way. Judith Lean, the solar scientist, finds Kaufmann's work unpersuasive and unnecessarily critical of China. Kaufmann finds Solomon's stratosphere studies lacking in evidence. Hansen and Trenberth can't agree on a budget. It seems staggering, then, that in a few years' time a new consensus will form for the next U.N. climate change report. But it will, and lurking beneath it will remain, as always, the churning theories and rivalries, the questions, the grist of scientific life. "All of these things contribute to the relative muted warming," Livermore's Santer said. "The difficultly is figuring out the relative contribution of these things. You can't do that without systematic modeling and experimentation. I would hope someone will do that." Meanwhile, the Argo ocean robots will improve, and Trenberth and Lean are pitching a low-cost program to NASA that will place devices to measure the planet's energy budget, in a global way, on the next fleet of Iridium phone satellites. "Maybe when coal burning triples," he said, "then we might sort it out."